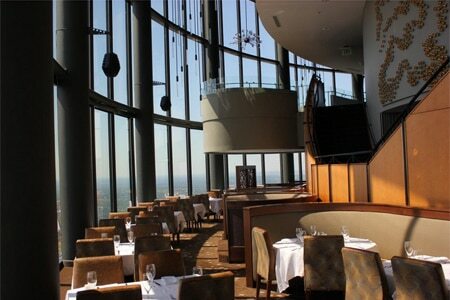 The view is more exciting than the food at this iconic Atlanta restaurant. Lunch Mon.-Sat., Dinner nightly, Brunch Sun. : A glass elevator dedicated to the establishment conveys guests more than 700 feet to the top of the Westin Peachtree Plaza Hotel, another of Atlanta architect John Portman’s revered buildings. This tri-level place features a bar as well as a view. Adding to the entertainment value is the music of the very fine jazz ensemble, the Mose Davis Trio, performing Wednesday and Thursday evenings in the cocktail lounge. But the food is underwhelming and heftily priced. Lamb belly "terrarium" brings to the table (for $16) a tilted glass bowl of lettuces with a scant few pieces of lamb belly. Raspberry-lacquered duck breast ($37) was nicely cooked but came with so many flavors on the plate, the poor duck had trouble making its presence known. Prices rise quickly from there, with a prime rib for two at $160. Splitting a regular dish will add $12 to the tab. For dessert, get the cheesecake. The wine list is an arrangement of familiar labels, a few of which are worthy of attention. You could gather at the bar for tapas, a pizza and drinks, but to get complimentary parking, you'll need to spend at least $75.